Now this may look like a rather humble dish, but I assure you it is anything but. I’m all about making vegetables the star of a meal and this dish truly showcases kale and chard as the main event, with avocado contributing a rich serving of nature’s butter. A way that I like to enjoy this dish is on toast with a generous serving of beetroot hummus, which makes a simple, nutritious dinner for busy people. Add a poached egg on top for extra sustenance. Kale is a stellar vegetable that is part of the brassica family (which also includes broccoli, cauliflower and Brussels sprouts). It rates highly in the area of carotenoids and flavonoids, the antioxidants which protect cells from free radicals. Kale is high in fibre, with one cup providing 20% of the recommended daily dose and also contains a high quantity of vitamin C, vitamin A and manganese. 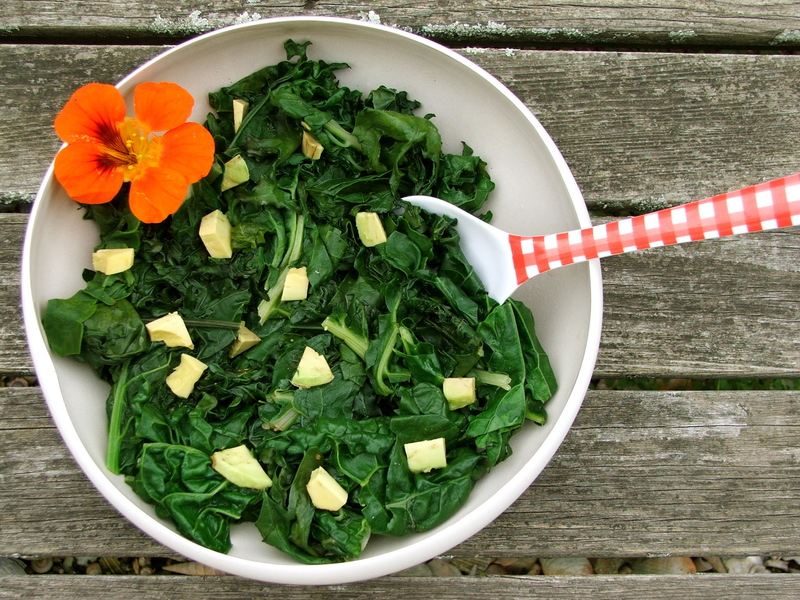 Kale also has the ability to lower levels of cholesterol and through the steaming process, this is further enhanced. The fibre components in kale work more effectively binding together with bile acids in the digestive tract when they’ve been steamed. As a result of the binding process, it is easier for bile acids to be excreted and viola! your cholesterol levels are lowered. In Dunedin you can buy kale at the Saturday Farmers Market and is currently in season, as is chard and avocado. Or if you are extra-amazing, grab some from your garden that you prepared earlier and get chopping. Heat a pan to a moderate temperature. Wash kale and chard thoroughly, remove stalks and cut in a rustic fashion. Once pan is heated, add the kale and chard and put the lid on. Steam for a couple of minutes until wilted. Season with salt, pepper and lemon juice. Transfer to a serving bowl and add diced avocado. Enjoy own its own or as an accompaniment to fish or meat.